The discovery of old photographic prints of Pirates, creased, faded and generally the worse for wear, was probably the key motivation for creating this digital archive site. Clearly it would only be a matter of a few years before these prints became lost or irreparably damaged hence the challenge of finding and archiving these images commenced. In comparison to the UK’s more recent breed of hockey arenas, the Peterborough rink has always had poor lighting for photographic work. The lighting upgrade in 2007 has improved matters considerably but prior to that and of course throughout the Pirates era, the lighting was a real struggle. Fortunately, Pirates were very lucky to have one of the UK’s best and most respected hockey photographers shooting them throughout most of their seasons. 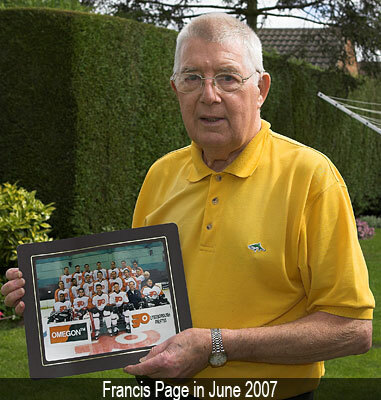 Paston based Francis Page was a freelance shooter who became a very familiar sight throughout most of the Pirates era and amassed quite a collection of images during his time with the club. It was a real pleasure to find Francis still at his Paston base and full of great recollections from the eighties and nineties. It was also a great boost to the archive when Francis agreed to search his house high and low and hand over all of his remaining prints to the archive. As a result, several hundred prints are now being scanned and archived and they will appear on this site during the months ahead …… and it may be a lot of months ! Frustratingly, Francis revealed that many of his prints had been “borrowed” over the years by various people that he couldn’t recall and have never been returned. We have been able to trace some to a publishing house in Blackpool and they have now been returned but there are still many very valuable prints out there ……. if you have any or know anybody who has, please get in touch. The majority of the remaining photographs of Pirates were taken by local media photographers and, in particular, the Peterborough Evening Telegraph. It was when first contacting the Evening Telegraph offices that we received the most soul destroying news so far. Just one week prior to our call, a member of staff had walked through the office asking if anybody wanted any old ice hockey prints ……. nobody answered and a black bin-liner full of prints was thrown into a skip ! It would appear that the negatives for the majority of these prints were long since destroyed too so attention has turned to the few “old” negatives they still admit to having. To date, they have refused to provide support for the archive but we will continue to work on them ! The Peterborough Standard, who later became the Peterborough Herald & Post, definitely had some very early images of first season Pirates games but they have so far failed to respond to approaches. They too will remain on our radar screens ! The majority of images on the site are from the Francis Page collection, some are from sources unknown and some are simply cuttings from magazines or newspapers. We are very grateful to all the photographers and contributors involved and appreciate the value your images add to the archive. If, however, there are any issues with us using any image, please get in touch and we will take the necessary remedial action. Last but not least, if you have ANY photographic prints of Pirates or you know of somebody who has or even might have ……. PLEASE get in touch. To view the growing archive gallery, please visit our Facebook Group HERE !